We found Joyce through recommendations in Worcester, MA and she was the first and only midwife we ever interviewed! Before we went through the miscarriage in September 2007, we had asked Joyce to be our midwife and the support she gave us through that time was incredible. You may think about only the birth process as part of a midwife’s job, but handling the tragedies and difficult situations that sometimes come up also comes with the territory. After our experience in 2007 with Joyce, we knew that we had the right midwife for us. Two weeks ago tonight, my incredibly courageous and divine wife...gave birth to our second son.... She birthed at home with the considerable support of a team of midwives led by Joyce Hunt Kimball. Joyce and her team enabled us to have such a beautiful birthing experience and provided over-the-top, Ritz-Carlton-quality care to our entire family from prenatal, delivery to post-partum. Joyce represents everything that birthing - and health care for that matter - could and should be. Joyce - you have our deepest appreciation! We love you! Joyce is truly amazing - a super woman. She's there 100% in support of you as a woman becoming a mother in all that is involved, from pre-natal questions, to labor to post-natal support. I'm left with a profound sense of love from her, and a non-judgmental attitude that made me feel completely safe. I love Joyce. My husband loves Joyce. She and her midwife partners did our family a service that I could never repay or forget. Because of Joyce, we were fortunate enough to have had the most relaxed, most beautiful home birth I could have ever imagined. If you're interested in someone who loves women, who loves babies and families, who is honest and real, who is funny and light-hearted, who is respectful and caring, look no further. When Joyce is with you, she is WITH YOU. She makes you feel as if there is no one else in the world besides you and your family. Through my entire pregnancy, labor, birth, and post-partum weeks, [Joyce] exceeded every expectation we could have had, by leaps and bounds! There were so many personal touches and extra expressions of thoughtfulness that it would be impossible to recount them all. We love Joyce! It's a hard thing to explain, but I honestly want to be pregnant again just so that Joyce can be my midwife again! Thank you for being our midwives, for being so gentle, respectful, sweet, encouraging, and just plain wonderful! You helped me trust my own body, relax in knowing that everything will be OK, and made the whole birth seem easy. You both are excellent at what you do. 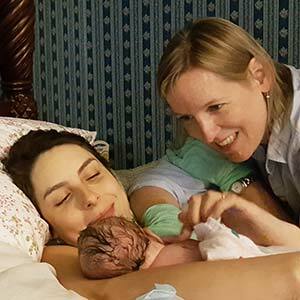 When my partner and I learned we were expecting our first child together, I called Joyce Kimball, who met with us and discussed a homebirth and her role as a midwife during the birthing year. It was immediately apparent that Joyce is a warm, calm, compassionate midwife with a wealth of knowledge, so we decided right then that we wanted to use Birth Services. We looked forward to each visit with [Joyce]. She is a wonderful listener, addressing any concerns you may have, explaining what changes your body is going through, and she is truly a wealth of knowledge with so many resources and suggestions on how to prepare body and mind for birth. She understands that we as women are perfectly capable of birth. Joyce always made my partner and I feel like we were her only clients even though she was constantly on the go! I loved having Joyce as my midwife. She is, in my experience, amazing. Our third child decided to throw us a major curveball and come frank breech! Joyce and her team were as calm as could be on the outside (heaven knows we were ALL freaking out on the inside). Even with all the added 'excitement' the whole birth was FAR less loud and stressful than my previous two 'textbook' hospital births. No one was yelling (except for me) to do anything, everyone spoke in calm, soothing tones, and all came out just fine (pardon the pun). Joyce is highly competent and an amazing soothing influence during pregnancy and the birth process. It is so hard to put into words how much you mean to our family and I am so happy we have become friends over these past few years. I meant to tell you when we were talking about the birth how [my partner] had talked about how he would have never have been able to attempt this homebirth if it wasn’t for you, and how much he trusts in you, your personality, and your knowledge and caring. You make such a difference in my life . . . thank you. Thanks for today and everything you do, all you give . . . time, compassion, kindness, generosity, knowledge, guidance, support, and love. I really couldn’t have gotten through this whole experience without you. I truly appreciate it all. You have helped me more than you could know! When I was pregnant the third time, I immediately called Joyce. I was very happy with her prenatal, delivery and postnatal care. She listens. She has a way of recognizing any fears or concerns and is able to address each one knowledgeably. She keeps up to date with new midwifery information. She was always reachable by phone or visits. Her team/accompanying midwives were also wonderful . . . just some of the things that allowed me to trust her and want me to lean on her during such an important time in my (and my children's) life! After [my first] homebirth, I realized that Joyce and her team were much more competent than my other midwives. My first birth (advising me to push when before my body was ready to, causing a lot of first and second degree tears) and adjustment to motherhood (difficulty breastfeeding and newborn jaundice) could have been a lot smoother or even avoided if I had had Joyce's help to begin with. I had some issues (hematoma) after [my baby's] birth, but Joyce's after care was over the top! I know that her care and suggestions helped me heal so quickly and thoroughly. Joyce is like her name, a Joy to work with. . . . All I have to say is that the advice, explanations and comfort that Joyce has to offer is second to none. Ultimately, I chose a home birth over a hospital birth because of Joyce. I was still nervous to have home birth—going against our culture's "norm." However, I was much more confident with Joyce and her expertise than any of my other midwives. She was so helpful in getting my team of midwives and home set up for [my baby's] birth so quickly! Working with Joyce as a midwife for a home birth was great. The best part of that was that we could arrange to have the prenatal visits at my home, and my son was able to participate. My son loved to put on the stethoscope (fetoscope?) and listen to my belly. My husband and son got to be a part of each visit and that was great. The best thing about Joyce is that she sincerely loves being a part of the birthing process. What I loved was how personally involved Joyce was and how honored she really seemed to be about being a part of the birth.